Dietitians are an important part of the medical field. These are the professionals who help you make good choices about the foods you eat in order to maintain a healthy lifestyle. It’s a satisfying profession because you help people in so many ways, including nutrition care and food management, and teaching people ways healthy food can prevent disease. The Commission of Dietetic Registration plays a big part in the accreditation process to become a registered CDR dietitian because it has created the test — the Registered Dietitian — you have to pass to get this coveted designation. 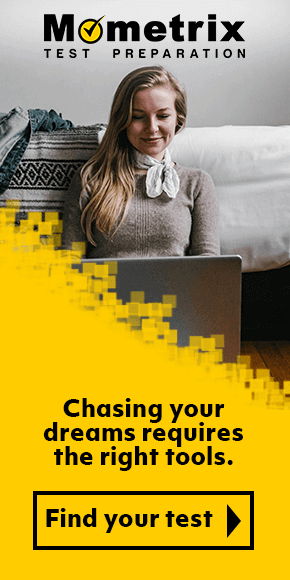 It’s also a good time to consider this career, as the Bureau of Labor Statistics estimates job growth in this field at 15 percent through 2026, a pace that’s far more robust than many other professions. If you’re interested in becoming accredited in this field, there are several things you should know. Which group administers the test for becoming a Registered Dietitian? The Commission of Dietetic Registration. Are there educational requirements to take the test? Complete an Accreditation Council for Education in Nutrition and Dietetics (ACEND) accredited didactic program in dietetic and complete an internship of at least 1,200 practice hours. Great. I meet the requirements. What’s next? 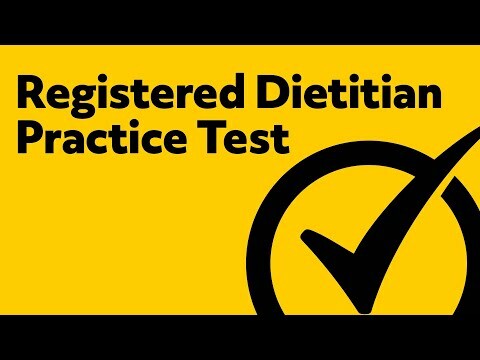 Once you’re certified by the Commission of Dietetic Registration, you can take the test. The test is administered year-round at one of 250 testing centers across the United States. That means there should be one within an easy commute. What topics are covered on the Registered Dietitian? How many total questions are on the exam? There is a minimum of 125 questions on the multiple-choice exam; each question has four possible answers. One hundred questions are scored, and 25 questions are pretest questions that are not scored. The maximum number of questions total 145 — 120 scored, 25 not scored. If a student fails to complete at least 125 questions, the student will fail the test. The total examination time is 3 hours — 2.5 hours to take the test, 20 minutes to complete a tutorial and 10 minutes to finish the post-examination survey. Yes. The fee is $200. How long does it take to get authorization to take the Registered Dietitian? It takes between two and three weeks from the time the Commission of Dietetic Registration reviews candidate qualifications, and the candidate receives the examination application. Once I receive the authorization to take the exam, how long do I have to take it? The authorization is good for one year. Can I use calculator during the exam? Yes, but it must be the online calculator included with the exam, or a calculator provide at the test center. You cannot use your own calculator. When will I get my test score? When you leave the testing center. What if I fail the Registered Dietitian? Can I retake it? Yes. You can re-take the test after a 45-day waiting period, provided you get reauthorization from the Commission on Dietetic Registration. There is no limited on the number of times a candidate can re-take the test. Any changes must be made at least 48 hours before the scheduled test time. A government ID that contains a photo and signature. Workplace, college or university ID’s will not be accepted. What else will happen at check-in? Eyeglasses will be examined before entering the testing room, and candidates will have their palms scanned to confirm identity. Can I bring personal items into the room when I’m taking the Registered Dietitian? No. The basic rule of thumb is no electronic devices of any kind are allowed, including cell phones, hand-held computers/personal digital assistants (PDAs) or other electronic devices. These must be turned off and placed in a secure area before entering the testing room. What about jewelry and other personal items? You can’t bring those in either. Watches, purses, coats, bags, and hats are among the items not allowed. 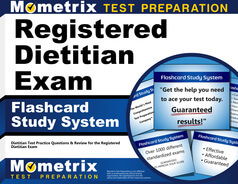 Mometrix has a number of tools that can help you study for the Registered Dietitian. Our comprehensive study guide has been researched by a team of professionals with years of experience helping educators prepare for exams just like this one. The guide provides specifics on how to tackle the questions you’ll be asked. if you’re worried at all about buying the guide, don’t worry. We offer a 100% risk-free, money back guarantee. Our large, easy-to-read flashcards help you learn through repetition, and the questions cover every content area of the exam. Not only that, the cards make it easy for a friend or relative to help quiz you on the questions you’ll need to know to pass the Registered Dietitian. Mometrix Academy is a completely free RD exam prep resource provided by Mometrix Test Preparation. If you find benefit from our efforts here, check out our premium quality Registered Dietitian study guide to take your studying to the next level. Just click the Registered Dietitian study guide link below. Your purchase also helps us make even more great, free content for test-takers. Our customers love the tutorial videos from Mometrix Academy that we have incorporated into our Registered Dietitian test study guide. The Registered Dietitian study guide reviews below are examples of customer experiences. The experience of the study guide so far has been very helpful in refreshing my memory about the materials learned in school. I also like the study tips and that there is a breakdown of the content of the exam. I highly recommend this book. I like the book that has great explanation of theories of learning, management and teaching. It is very helpful in my review which has help restoring my confidence in preparing the RD exam. I purchased the Registered Dietitian Exam Secrets Study Guide and the Dietitian Registered Technician Flash Cards. Both have been very helpful in studying for the Registered Dietitian Exam. The book is straight to the point making it easier to understand and study with. The flash cards are nice because I can take them anywhere. I don’t have to be on a computer to study. I purchased the paperback edition and used it to supplement my other RD Exam study materials. I would definitely recommend the book for this purpose. It is a life-saver when you’re feeling bogged down with all the detail in other study materials and need more of a a “big picture” perspective. It contains a ton of great information and it’s making me start to feel more comfortable about being ready for the RD exam. I like how it is broken up into sections so it doesn’t feel like the information has no order. That really helps with keeping the information planted neatly into my brain and is helpful when studying. 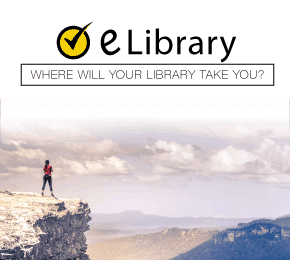 I think that the organization of the material is great and I also really appreciate that there were free study tools offered on the website as well (overcoming test anxiety, study secrets, vocab list, etc.). I also like that the section in the study guide about types of learning and what can be most effective because I often learn that through trial and error, which can be a huge waste of time! I am very excited to take my test. The material has been great. I feel like this will help me pass my test. I have bought a lot of material and this has been the easiest to follow and understand. The study guide is very helpful. I had hard time understanding few concepts but, the study guide helped me understand those concepts among other concepts. The best part is the practice test which gives you a hands on experience with the actual RD exam. It is useful, direct to the point and an excellent prep tool for the RD test. Found material relevant and helpful. Worth the money spent for sure and much more. I found the book to be very simple to understand. It has the key points that helps me understand the subject, and concise.